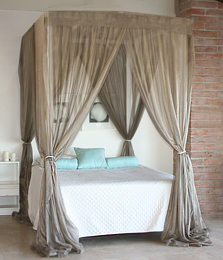 If you need help to sleep, sleeping within a zero-EMF sleep canopy can make all the difference in the world! This brief 1 minute video demonstrates the DYI sleep solution that is proven to actually enable healthy, restorative sleep. Protect yourself from the EMF (electromagnetic fields), electrosmog and wireless pollution in your bedroom that is caused by electronic devices, cell phones, WiFi, WiMax, Bluetooth, cell towers, power lines, airport radar, and a myriad of other wireless communication signals that interfere with your cell's own bioelctrical signaling function, disrupting your sleep and much more. 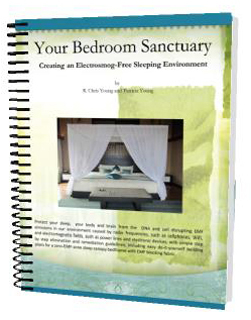 Easy do-it-yourself bedframe canopy plans are included in the ebook "Your Bedroom Sanctuary: Creating an Electrosmog Free Sleep Environment", written by professional senior electrical engineer, Chris Young PE, and available on our site by instant download. This ebook was written to provide you with help to sleep as peacefully as nature intended, using experienced EMF Detection and Protection know-how combined with a positive can-do DYI approach. This informative ebook will enable you to achieve EMF (electrical magnetic field) safety and freedom from wireless pollution that you can trust, at far less than a costly on-site professional EMF Expert consultation, in the full confidence of doing business with an experienced electrical professional. EMF is scientifically well documented for disrupting cell function, to the point where our sleep is not restorative and our physical, emotional and mental function begins to break down. As this happens we become more and more sensitive to EMF. According to many authors EMF sensitivity has grown to epidemic proportions. Further evidence supporting this hypothesis is that many people who suffer from EMF sensitivity or EMR sensitivity, also known as electrosensitivity syndrome (ES), electrohypersenitivity disorder (EHS), and other names, have numerous other collateral health problems. Many of our residential and workplace clients suffer from Electromagnetic Hypersensitivity (EHS), or Electrosensitivity (ES) and we thoroughly understand what is involved and what is necessary to create a comfortable, health conscious and safe environment and provide the personal protection information that promotes recovery to full health. If you need help to sleep, the very best place to start is to protect yourself from the EMF in your sleeping environment - the place where you spend a third of your life, during the most important hours for cell,neuron and DNA rejuvenation, healing, repair and high level function. Wikipedia explains more about Electrosensitivity and its strong causal link with sleep disorders?